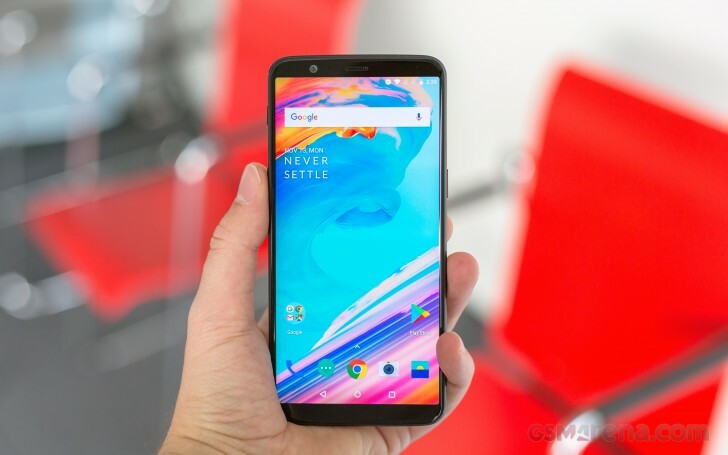 The OnePlus 5T is the mid-season substitute to the company's flagship (and, as of late, only) smartphone. The T doesn't bring radical changes - on the contrary; it's a minor update to help the 5 stay in fashion and, as a side effect, why not spark up buzz right in time for holiday shopping. The most significant and readily visible alteration is the screen - it's now a trendy, tall, 18:9 6-incher. It's not state-of-the-art in terms of resolution, but OnePlus has always insisted anything beyond FullHD is overkill. Well, this one is, but just on the long end - 2,160x1,080 is all the pixels you're getting. No, in fact, you're getting more pixels, some 52 million of them, spread over three cameras. The one on the front remains unchanged at 16MP, f/2.0, and so does the 'primary' unit on the back - another 16MP, this one with a wider aperture f/1.7 lens. But the 'secondary' cam on the back is new, sort of - 20MP like on the previous model, but now with a different, f/1.7 aperture lens. 'They made a telephoto lens that bright? ', you ask. No, they didn't - the secondary cam has the same 27mm equivalent focal length as the primary one - the aim is to improve lowlight photography, but portraits with blurred backgrounds are a go, too, fret not. The rest of the OnePlus 5T is very much the same as the OnePlus 5, which isn't really a bad thing. For the most part. These in-between OnePlus models - we can't make up dad-joke-grade number puns when there are letters in the name. Cheers, OnePlus, for sparing us the embarrassment with the 5T. We had a few criticisms for the 1+5, and these still stand true for the 5T as well. There's still no dust and water resistance when pretty much every flagship on the market now carries an IP67 or IP68 rating. Stereo speakers aren't as common, but we're seeing steps in that direction. Not from OnePlus with the 5T, though. Storage expansion isn't something OnePlus is a fan of either, only fitting a microSD slot on the X a few years ago. Again, none on the 5T. It's more than a little disappointing to see the 5T launch on Nougat - Oreo has been out for a while, and with OnePlus's near-stock software we just assumed that it would boot Android 8.0 from day one. We assumed wrong. The final red flag is the camera. Why swap out the telephoto shooter (which, admittedly, it barely was) for a second wide-angle cam that's got the same field of view as the primary one? We'll be investigating what exactly is happening under the hood, but not before the usual unboxing and a look at the hardware. Let's get going. Display: 6.01" AMOLED, 2,160x1,080px resolution, 401ppi; sRGB/DCI-P3 color space support. Chipset: Qualcomm Snapdragon 835: octa-core CPU (Kryo 280, 4x2.45GHz + 4x1.9GHz), Adreno 540 GPU.